A Winter Warmer in November? Even know it is still fall…this just seemed appropriate for the nasty weather day we are having today…and what is that Winter Warmer I speak of? 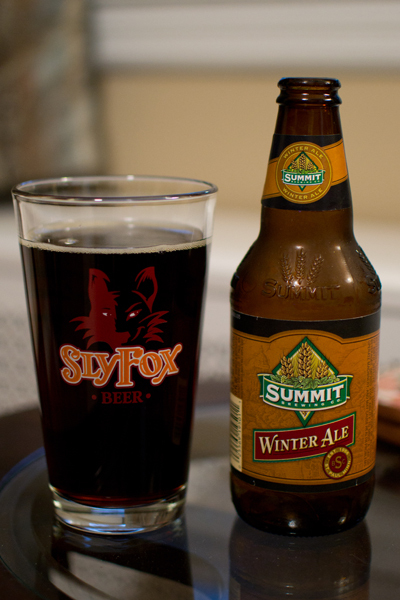 Why it is beer #359, Winter Ale by Summit Brewing Company from St. Paul, Minnesota. This beer is brewed in the style of a Winter Warmer as I alluded to before and has an ABV of 6.1%. Into my pint glass went this very dark liquid…dark brown…possibly black in color. The head was pretty much non-existent. I took a smell…lots of chocolate and an earthy, nutty aroma greeted the nose. So far so good so I took a taste. It had some decent roasted malt flavors up front with chocolate, a bit of dark fruit raisin like thing and some brown sugar. Towards the back end it was coffee mixed with cocoa and that cocoa went on into the aftertaste. Medium bodied, moderate carbonation, and highly drinkable was this yummy brew. I liked this quite a bit though at times I thought of this more as a Porter but it still was nice and tasty. I’m not sure how this could keep one warm in the winter, I would think the ABV would have to be jacked up fairly high for that.